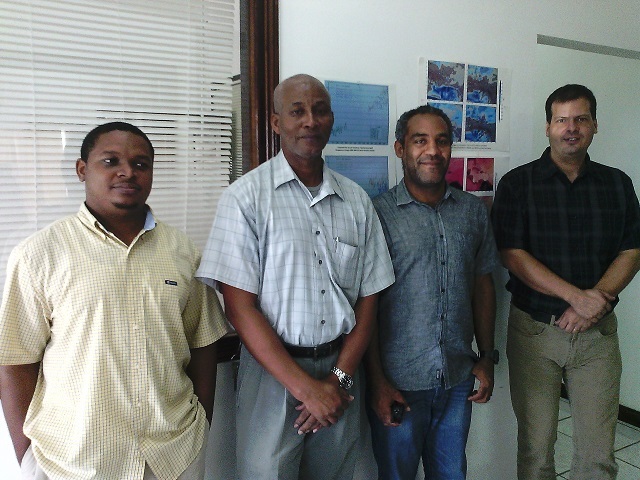 Climate Modellers from across the region met at the Caribbean Community Climate Change Centre (CCCCC) this week (June 11-12, 2014). The modellers explored the development of user protocols for data access, regional data management, ways in which to consolidate and prepare outputs and a strategy and action plan for the next 5-10 years. 2. To prepare a first draft of a document charting the way forward for the climate modelling group. Arnoldo Bezanilla (INSMET, Cuba), Jayaka Campbell (UWI Mona, Jamaica), Dr. John Charlery (UWI Cave Hill, Barbados), Ronald Gordon and Dennis Gonguez(MetService Belize), and Peter Donk (University of Suriname), alongside the 5Cs' Albert Jones, Timo Baur, Joseph McGann and Albert Gilharry. By caribbeanclimate in News on June 12, 2014 .